•	Load ranges from 500kg up to 950kg per wheel. 82mm white nylon pallet roller with a tread width of 70mm, fitted with 6204 2RS 20mm ball bearings Load capacity 600kg. 85mm diameter white nylon pallet roller with a 20mm 2RS ball bearings tread width 70mm, load capacity 650kg. 82mm white nylon pallet roller with a tread width of 70mm, fitted with 6303 2RS 17mm ball bearings Load capacity 600kg. 85mm diameter white nylon pallet roller with a 25mm 2RS ball bearings tread width 70mm, load capacity 650kg. 85mm diameter white nylon pallet roller with a 17mm 2RS ball bearings tread width 70mm, load capacity 650kg. 82mm white nylon pallet roller with a tread width of 70mm, fitted with 6005 2RS 20mm ball bearings Load capacity 600kg. 85mm diameter white nylon pallet roller with a 20mm 2RS ball bearings tread width 90mm, load capacity 850kg. 82mm white nylon pallet roller with a tread width of 60mm, fitted with 6204 2RS 20mm ball bearings Load capacity 500kg. 85mm diameter white nylon pallet roller with a 25mm 2RS ball bearings tread width 90mm, load capacity 850kg. 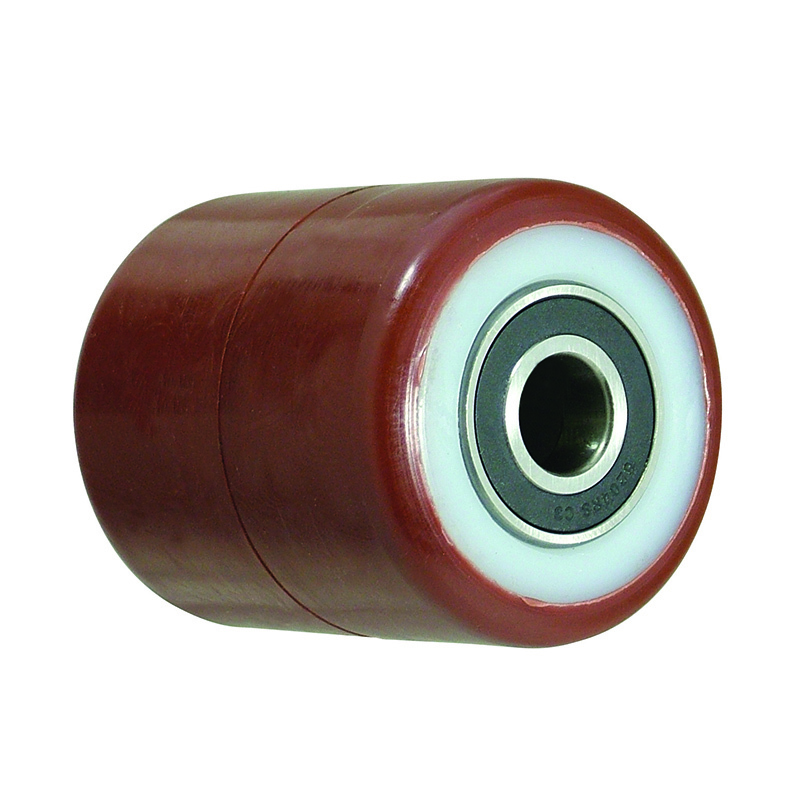 82mm brown polyurethane tyred on white nylon centred pallet roller with 20mm 2RS ball bearings tread width 60mm. Load capacity 350kg. 85mm diameter white nylon pallet roller with a 17mm 2RS ball bearings tread width 90mm, load capacity 850kg. 82mm diameter white nylon pallet roller with 17mm 2RS ball bearings. Tread width 60mm, load capacity 500kg. 82mm white nylon pallet roller with a tread width of 75mm, fitted with 6204 2RS 20mm ball bearings Load capacity 700kg. 82mm white nylon pallet roller with a tread width of 90mm, fitted with 6204 2RS 20mm ball bearings Load capacity 800kg. 85mm diameter white nylon pallet roller with a 20mm 2RS ball bearings tread width 100mm, load capacity 950kg. 82mm white nylon pallet roller with a tread width of 60mm, fitted with 6005 2RS 20mm ball bearings Load capacity 500kg. 82mm white nylon pallet roller with a tread width of 90mm, fitted with 6005 2RS 25mm ball bearings Load capacity 800kg. 82mm white nylon pallet roller with a tread width of 75mm, fitted with 6303 2RS 17mm ball bearings Load capacity 700kg. 82mm white nylon pallet roller with a tread width of 90mm, fitted with 6303 2RS 17mm ball bearings Load capacity 800kg. 82mm diameter white nylon pallet roller with a 20mm 2RS ball bearings tread width 100mm, load capacity 950kg. 85mm diameter white nylon pallet roller with a 25mm 2RS ball bearings tread width 100mm, load capacity 950kg. 85mm diameter white nylon pallet roller with a 17mm 2RS ball bearings tread width 100mm, load capacity 950kg. 82mm white nylon pallet roller with a tread width of 80mm, fitted with 6204 2RS 20mm ball bearings Load capacity 700kg.